WINDOW ROCK — At 5:15 a.m., sunrise is only a thin pale highlight over red rock mesas in the east as Alicia Hale steps out of her house for her daily run. Even in June, the morning is so chilly at an altitude of almost 7,000 feet that she needs several layers to stay warm. The only sounds at this hour are the roosters announcing the coming of a new day. They’re vocal and insistent — a soundtrack that could be considered jarring but that actually fits the environment. Instead of shattering the sublime atmosphere, their crowing enhances it. 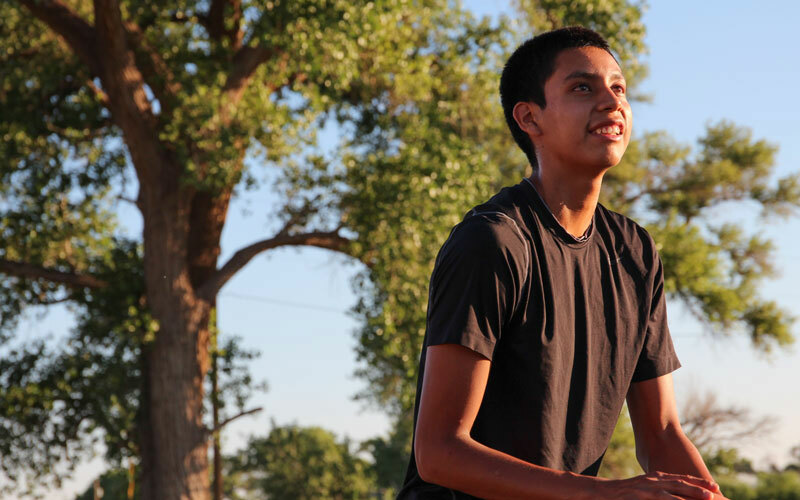 Sixty miles to the northwest, in Chinle, the day progresses in similar fashion for Shane Yazzie, who will be a junior at Chinle High School in the fall. He runs, he does his chores and he practices basketball — he practices until he simply can’t anymore. 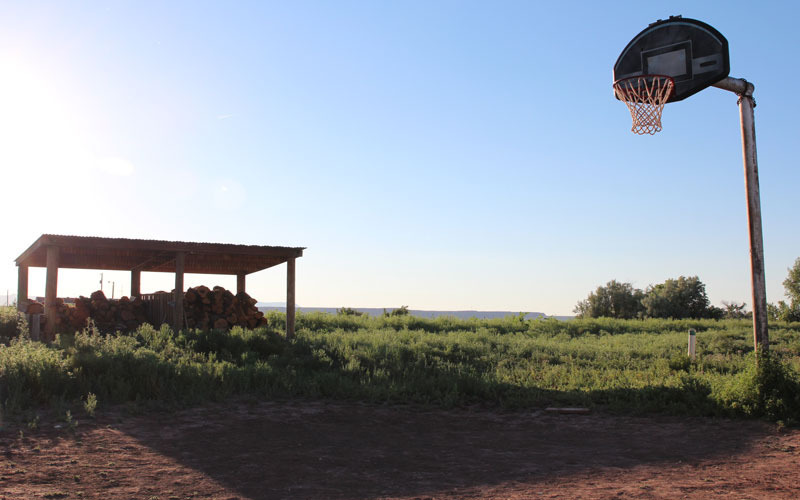 As the day draws to an end and the sun sets behind the equally picturesque mesas that frame the valley where Shane lives, he shoots baskets until the light is gone — and sometimes later. There are times when he plays so late that only shouts from his parents to come inside so they can sleep will force him to stop. “If it’s raining, he’s out there in the mud. Rain, snow, or shine, he’s dribbling the ball outside and we don’t have the luxury of having a nice concrete court for him. It’s just dirt and an old basketball goal,” said Shane’s mother, Glendalyn. Shane practices on a dirt court behind his house. His pounding steps and incessant dribbling have killed off the weeds that inhabit the rest of the area. A patch of bare earth, pockmarked and uneven, has been left behind for him to hone his game. “Basketball is almost a religion here,” said Pete Butler, the head coach of the girls’ team at Chinle High School. “In our culture, running is part of who we are. It comes very natural when you see our teams running up and down the court,” said Youvella. Youvella doesn’t make his statement lightly. The boys cross-country program at Hopi Junior/Senior High School is unmatched by any other in the nation. The National Federation of State High School Associations lists Hopi High School — officially known in the record book as Keams Canyon Hopi — as the winner of the most consecutive state titles in U.S. history. 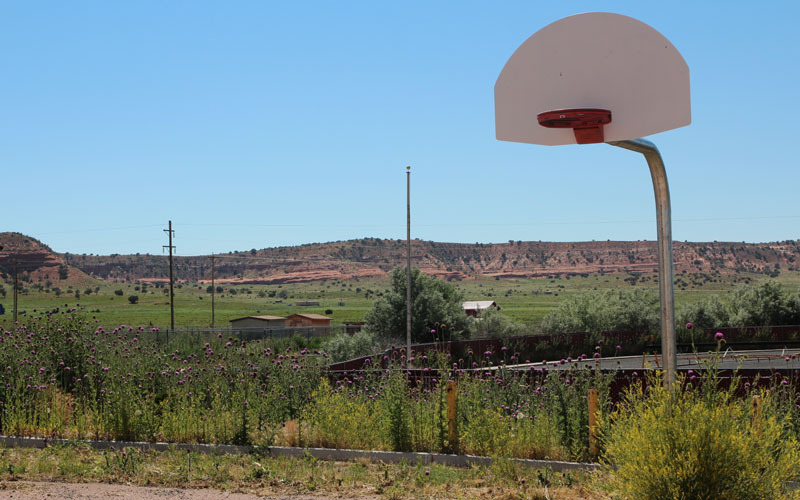 Despite Hopi High School’s unprecedented success in cross-country, basketball is preferred above all other sports on the reservation, though many basketball players compete in both sports so they can maintain the incredible endurance required to be effective on the court. “They don’t really look at the clock as far as time, situation, score, et cetera. They just play,” said Raul Mendoza, head coach of the boys basketball team at Window Rock High School and a legend on the reservation after 38 years as a coach. More than 40 years later, the style of basketball is still nearly identical. The No. 1 tenet is the same: run. Alicia Hale’s 5:15 a.m. regimen, six days a week, currently has her running 3 miles per day but this summer she has stepped up her training and commitment to basketball and 3 miles will not be enough for much longer. “By the end of the summer, I want to be running 5 to 6 miles each morning,” she said. “Rez basketball is a very high-paced, very talented, intense form of basketball that I don’t care who you are, you’re going to enjoy watching it,” said Harold Slemmer, the executive director of the Arizona Interscholastic Association. Fans on the reservations don’t just enjoy watching it. They love it. They live it. “Chaos, just chaos” is how Window Rock High School senior center Branon Chickaway describes the fans during basketball season. He will be one of Mendoza’s co-captains next year and he likes the chaos. 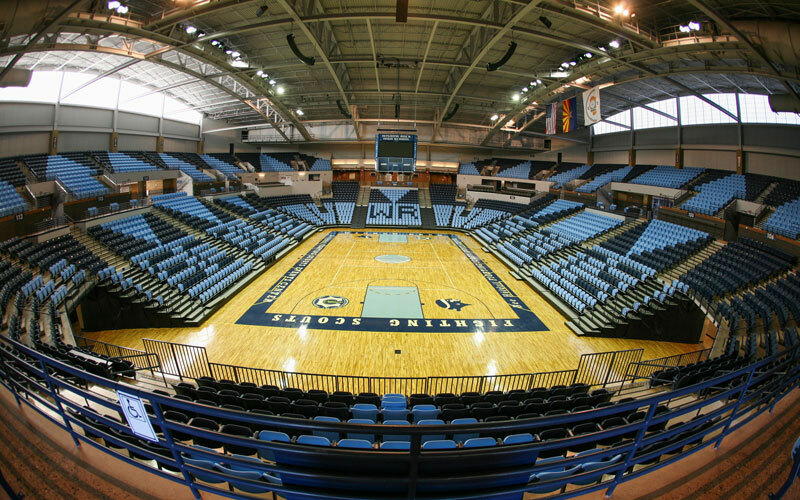 He fell in love with basketball at a young age when his maternal grandparents took him to a game at the old Veteran’s Memorial Field House, where almost 2,000 screaming fans were packed into every corner of available space. There is a bay for the media with two rows of seats and tabletops for computers. There are six concession stands in the corridors. There are boys’ and girls’ dressing rooms with the Window Rock Fighting Scout logo stitched into the carpet, cherry wood lockers for each player, and chairs with the mascot emblazoned on the leather-cushioned seats. In short, it’s a professional setup — on a smaller scale — for a school with an enrollment of roughly 700 students. “It’s very important to us. I believe it’s in our DNA to be competitive. It’s natural. We’re very competitive people,” he said. Branon Chickaway and Shane Yazzie love playing in front of legions of screaming fans. They thrive on it. But others admit it can be difficult. “You may win two straight state championships and the community is waiting for that third,” said Pete Butler, the Chinle girls basketball coach, though he still relishes the job of coaching at a high-profile school. “They try to control you on the court even though they’re in the stands,” she said. “Some kids told me that it’s no fun to play because there’s so much pressure. A lot was expected of them. I think the fans really expect a lot out of the kids,” he said. Despite the high expectations and the near-constant bellowing from the crowd to shoot the ball, Amanda said she got used to the noise after that first game and now wouldn’t trade the passion of the fans for any of the possible negatives. “I love the sport and I can’t go a day without it. I have to have that ball in my hand in order for me to think straight,” she said. Shane and Amanda — two kids with nearly identical thoughts. They are separated by two years at Chinle High School but have the same yearning for the game. “If it wasn’t for basketball, or any of the sports that we have, I think that a lot of our kids would go astray and turn to drugs and alcohol and other bad things that they encounter,” said Shane Yazzie’s mother, Glendalyn. Parents use discipline, traditions and a deep-rooted understanding of their values to instill self respect and respect for the community in their kids to help them avoid the “bad influences” that can lurk in places with limited opportunities. Alicia Hale counts those values on her fingers as quickly and easily as if she were reciting the first five letters of the alphabet: faith, family, school, sports and friends — in that order. “When I step on that court, I feel like there’s a lot of people watching me. They watch to see what you do and how you do it — how you present yourself on and off the court,” she said. “If you play basketball, you represent your school, your team, your family, your clans and your community. Your community looks up to you,” he said. Branon Chickaway’s grandfather, Gabriel Haskie, used an ancient ceremony to help Branon begin to walk on the correct path. When Branon was 12, Haskie took him into a sweat lodge to pray. The commitment to sportsmanship isn’t a new phenomenon. Horning, the former referee, had the same the experience more than 40 years ago. Glendalyn and Shawn Yazzie made it very clear to their son Shane that without the grades, there is no basketball. “We make his education the priority, then his sport,” said Shawn. Shane saw the lesson firsthand when his father told one of his older brothers he was no longer allowed to play because his grades had begun to suffer. Shane has no intention of jeopardizing his career. “It gives me motivation in school to keep my grades up,” he said. Vernon and Clarissa Hale say they’ve never had to worry about Alicia’s performance in the classroom. She has been on the National Honor Society every year and the benefits and importance of a quality education are consistently at the forefront of her thoughts. Alicia has one more year to prove herself on and off the court. 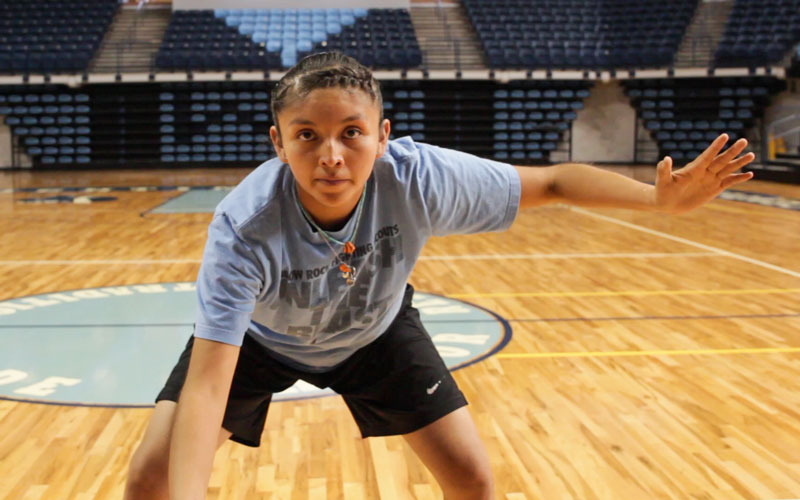 Like many others on the reservation, she’ll play in summer leagues hosted by her high school. She’ll play on club teams and AAU teams in tournaments across Arizona to showcase her talents with the hope of earning the college scholarship she wants so badly. Finally, as fall turns to winter, she’ll jog onto the court again in front of thousands of screaming fans who have arrived from all corners of the Navajo Nation to watch the sport they love. It will also be Branon Chickaway’s final year on the floor of the Window Rock Fighting Scouts Arena. His grandparents — who have raised him — had six children of their own and survived years of travel and expense as they watched their kids play every sport possible. So, as Branon grew — he’s 6 feet 2 inches tall now — his grandfather, Gabe Haskie, knew what would come next. As he thinks back and retells the story of his reaction to Branon’s announcement that he wanted to play basketball like his aunts and uncles, he nudges his straw cowboy hat back a little further on his head. “‘Good,’” Haskie told his grandson. Then he pauses, looks down and takes a deep breath, mimicking the moment he and his wife committed to several more years on the road to the arenas of the Navajo Nation. When he looks up, there’s thin smile on his lips and a bright light in his eyes.